I’ve been going to DragonCon in Atlanta for years. Recently I’ve made it my goal to take as many pictures of good superhero costumes as possible. I snapped over 400 good pics in 2007 and again in 2008. You can view some of my DragonCon pics here and here. 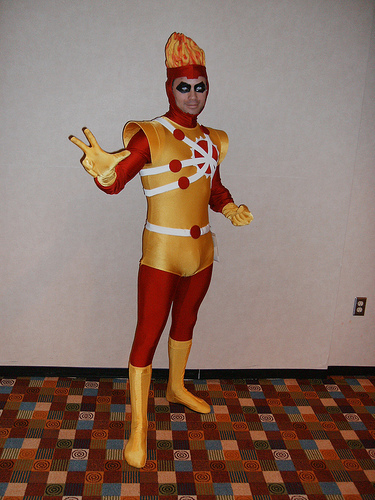 So I’m astonished that I missed the guy dressed as Firestorm at DragonCon 2008. How did I miss this guy?!?!?! 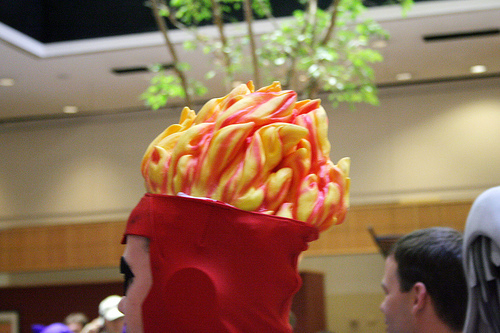 Here is a close-up of his flaming hair. Well done! 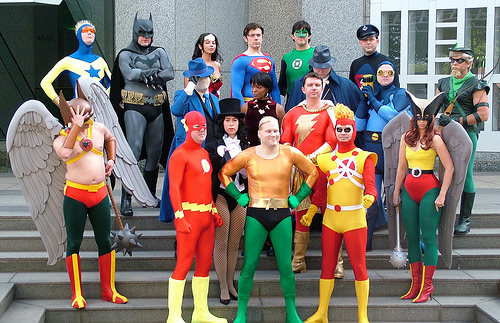 Finally, here is a Justice League gathering at DragonCon. I’ll have to watch closer this year! Posted in: Cosplay, Firestorm #01: Original (Ronnie/Martin), Justice League of America. 2) There exists some other errant reference sheet that all these folks are getting their incorrect dot from (or are basing their works on something that was based on the errant reference, like a photocopy of a mistake). So, Mr. Firestorm Fan, how about it? Are the pieces starting to fall together for the longest- running conspiracy in the DC Universe?! What is… THE DOT? My nose is twitching! C’mon, Sue… there’ s a MYSTERY to solve! … Sue? … Suu-uuee… Wakey, wakey! … Crap. If you consider the wrap-around logo as a 3-dimensional nuclear atom, there should only be one globe for every white ring. There’s three rings, three globes. People could add two to one in their designs, but I don’t think it makes sense or looks good. In most instances, Flamehead was drawn with three globes, all on the left side only. This costume, apart from the one glitch, is pretty freaking awesome! Steven – Very interesting observation. I didn’t even notice that! And Outburst is correct, the white rings are supposed to represent electrons orbiting the nucleus of an atom. So having two electrons on the same orbit is just asking for trouble. Now that you’ve brought a number of inconsistencies to my attention, I have to wonder if this isn’t the greatest DC mystery since Armageddon 2001 and the TRUE identity of Monarch. I will investigate and report back on this conspiracy! Heck, I’m thinking this might be bigger than when the JSA vowed to track down the murderer of Mr. Terrific in 1979 (Justice League of America #171-172), and it wasn’t resolved ’til 1997! Could this go even deeper than the temporal paradox of the original Wonder Girl (the adventures of Wonder Woman when she was a girl) being inducted into the original Teen Titans? Does anyone recognize the guy with the military style hat to the right of Green Lantern and behind Blue Beetle? You didn’t see him because he was warned about you, Shag. The restraining order is already in the works. The guy in the military hat is Captain Action. He never was a member of the JLA but he was briefly published by DC. Maybe he stop by to say hi so old friends. I love Hawkman’s “facepalm” look. I imagine because Captain Action is hanging out with them! Poddington – Thanks for the heads-up!